The November 3rd episode, “Indifference,” showed us that Rick is a hypocritical, ego maniac, far removed from the leader and Democratic ruler he once was in seasons past. I was in shock and awe and let me admit it, I was pretty pissed off with Rick’s actions. In fact, I woke up the next morning after watching it and I couldn’t stop thinking about what he did and that’s when I knew this season is right on track. When a show can conjure up emotions and make the viewer get right in the thick of the feelings with the characters, now that is good writing my friends. With Daryl, Michonne, Tyrese and Bob gone to look for meds that leaves Rick with few options of camp members who can help him look for supplies and food. Rick asks Carol to come with him, typically she stays behind to tend to the nest, but this time he insists. Rick is starting to realize that the control and authority he asserted over her and others has waned and he cannot be counted on to take care of the pact as the sole leader. He is a “farmer,” as Carol says and she had to save the group by killing them off. They would have died anyways she insists. At the house they meet two wanderers who have been hiding out in the house and Rick gives them the 2 question test, to which they sorta pass. Carol pops the guy’s dislocated soldier back into place and Rick watches, almost as if he doesn’t recognize who she is anymore. Where did she learn to do this? She has become so self-sufficient and strong that it almost makes him realize at that moment she has changed. She is not the scared, grief stricken woman she was in Season One. She’s now Carol the badass. 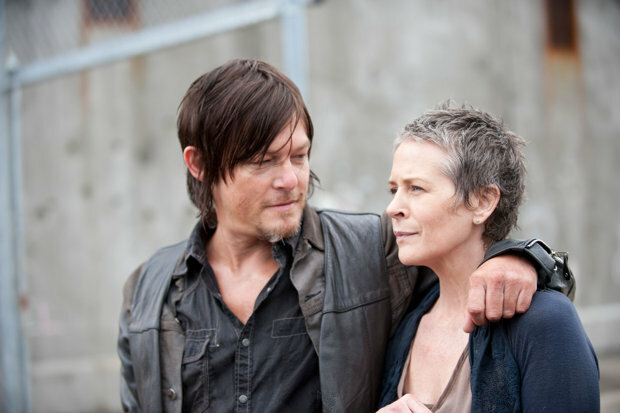 With that in mind, Rick decides to leave Carol behind packed with supplies and tells her to leave. She is no longer a part of his tribe and she has been ousted without anyone else’s knowledge. 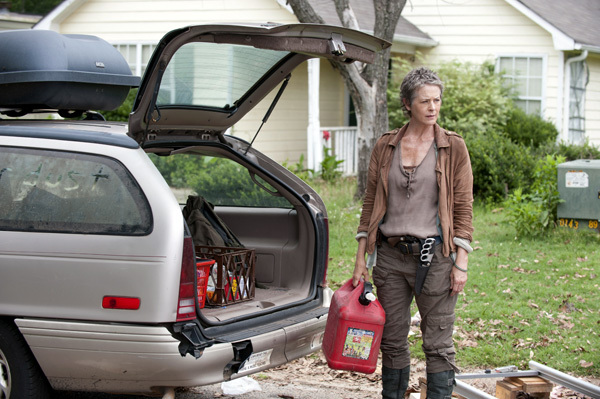 Carol drives away and all I kept thinking was Daryl is going to be angry when he hears about this news. The other group finds the medicine and Tyrese is shown to be on the verge of a nervous breakdown and Bob is revealed to be an alcoholic, who is willing to risk his life for a bottle of booze. He wants it for the “quite times,” he says and I guess to some extent we can’t necessarily blame him. I think I would need a drink after a long day of killing zombies! But seriously he is dead weight, he needs to either shape up or ship out. Thus far I have enjoyed this season much more than the previous Governor debacle. It’s back to the basic humans versus zombies fighting for survival. I vote for Marilyn Manson to make an appearance, who is with me on this one? Ohhh, you are right I had not thought of it like in that way. True I think you are on to something, maybe Daryl will go look for her and start a new crew with her. Now that would be cool to see !